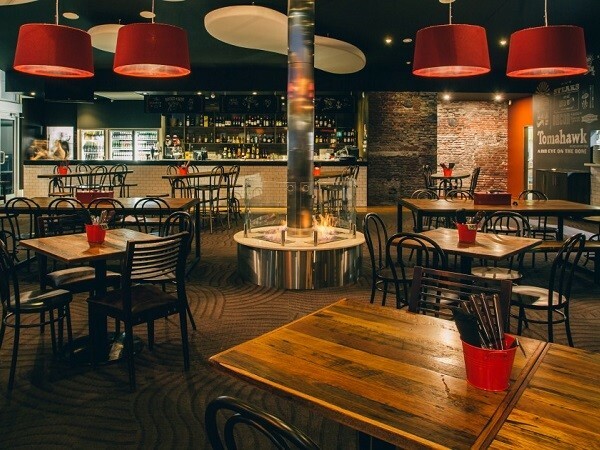 Design firm At Home Interiors used four fires from EcoSmart Fire to create a stunning focal point at a waterfront restaurant in Wollongong. Once a formal dining space full of luxurious fabrics and elegant furnishings, the waterfront restaurant is now a casual eatery called The [M]eatery, featuring an industrial vibe with steel elements and moody colours. Designed by Cristina Hofman from At Home Interiors, the former RockSalt Bar and Grill has gone through a complete makeover with the new owners requesting a completely different look to go with the new name and menu. According to Cristina, the design brief from the owners was to overhaul the entire space and make it more casual and inviting, as the previous venue was quite formal. The menu went from a seafood focus to one that was more meat-oriented. They decided on a soft industrial look for The [M]eatery, keeping in mind the meat-based menu as well as the younger clientele they aimed to attract. Design highlights included large, communal tables to encourage the sharing of food (such as the platters of succulent meat now available on the menu) as well as splashes of red, a black ceiling, a raw brick mural and chalk drawings. However, there was one feature that remained untouched during the renovation work because of its irreplaceable effect on the ambience and atmosphere of the Wollongong venue. Cristina explained that they decided to retain the fire feature as it served to anchor the large space. The four EcoSmart fires from the XL500 series placed around the large concrete support column create a stunning focal point, and work perfectly with the steel elements, the pops of red and the dark roof to create a space full of ambience. A few pendant lights were also fitted around the column for added effect. Live music is slowly being introduced to create a relaxed and inviting atmosphere. Cristina is full of praise for the EcoSmart fires, though they came with the original restaurant’s interiors. She says they are versatile in design application, look stylish, have a compact design, aren’t messy and don’t need to be vented. She is planning to use EcoSmart fires in her next project. Cristina has received a stack of compliments from customers who love the new design of the [M]eatery, and has even been tracked down by other restaurant owners who would like her to refurbish their dining venues.